What are your predictions for today big match?? How important do you think this game is for the World Championship match? The World Champion is still the #1 ranked player in the world. 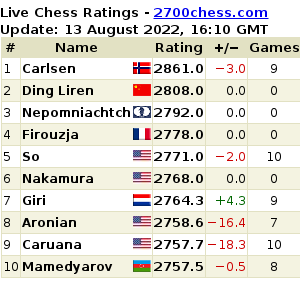 But he is only 7.4 points ahead of Caruana, 15.2 points ahead of Mamedyarov, and 31.4 points ahead of Ding Liren! It is getting real tight at the top! Hi from Chess Coach GM Igor Smirnov Main Package. With the package, you can buy a lot of products simultaneously with a very big discount! Can you Do it As the Best? White to play. Perhaps this is not the winning combination of the game, but for sure it is a very strong continuation which gives definitely the advantage to White. Can you find the move?